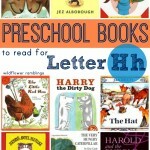 You are here: Home / Books for Children / Why read nursery rhymes with my child? Why should I read nursery rhymes with my child? Why recite these silly verses together? Rhyming with children helps them to develop and understanding of sounds and words — and they are fun!! 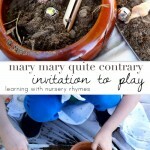 Here is a compilation of some of our favorite resources for how to incorporated learning these rhymes at home and at play! Quick! Think of a nursery rhyme that you know by heart. Now think of another. And another! 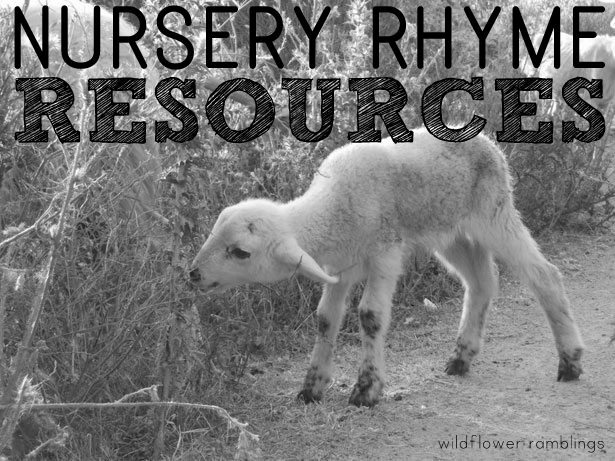 Nursery rhymes help develop phonological awareness in young children. These poems promote memorization skills, word and sound blending and segmentation, and they help your child to understand the structure of the English language. Not to mention that they build brain power!! 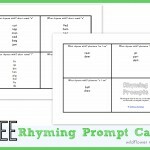 They are easy to memorize because of their sequence, rhythm, and rhyming words. We put a new nursery rhyme up on our wall each week and try to recite it each day. By the end of the week, we all have these wonderful rhymes memorized! Sing the song in a rhythmic pattern. Don’t worry about your singing voice, but instead, enjoy your time together. 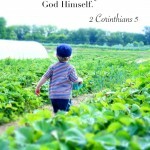 Point to the pictures as you are reading: point to the hill, the pail of water, his “crown” …etc. Delight your child by doing finger motions or body movements along with the song. Utilizing fine and gross motor muscles help a child learn and remember, even before they begin to speak! Focus on body parts whenever possible so your child can learn them as you rhyme and sing. 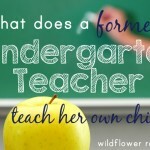 As your child grows, you can answer the who, what, where, when, why, and how of the nursery rhymes through discussion and research. You could even research the meanings behind some of the rhymes together — if it’s not too morbid because sadly some of them do come from very depressing and troubled states of mind. Focus on one nursery rhyme to teach a certain concept, such as Hickory Dickory Dock for time or discussing history references such as the candlestick in Jack Be Nimble or British history in London Bridges — the possibilities are endless! 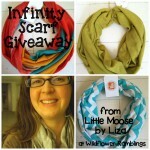 What are your favorite ways to read and play with nursery rhymes at home and at school? 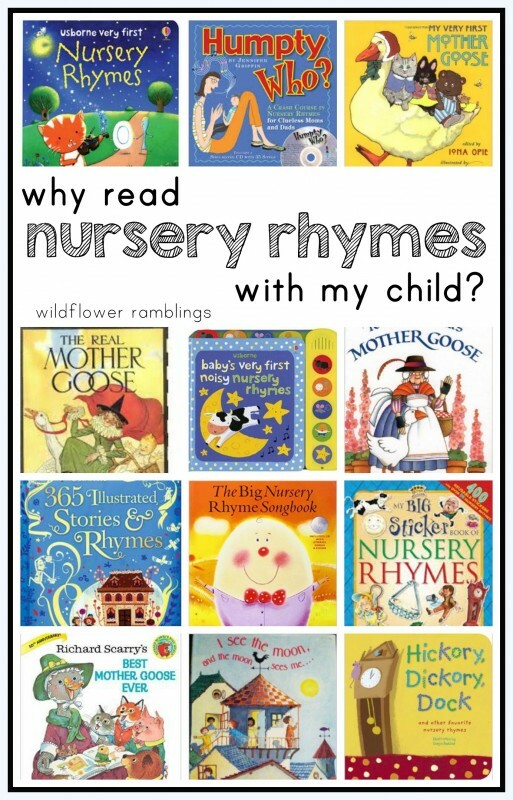 Why read nursery rhymes to your child? Let me know what you think! 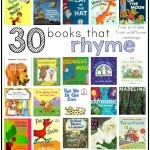 Thank you for wonderful ideas and links using nursery rhymes. 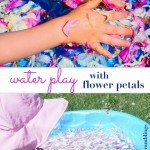 I will have fun incorporating them as I play with my 2 and 3 year old grandchildren. Have fun with your grandchildren, Yvonne!! Thanks so much for visiting!! Thank you for the nice compilation of resources. I love reciting and reading rhymes with my children. Their favorite book is illustrated by Englbriet (hope I spelled that correctly). The illustrations are so engaging and not garish. Hope this helps.